I am very proud to present a rare species which, I have the honor to be named after me. I discovered it in 1997. After many years of investigation it was described as a new species in 2009 by Ralf Hand and Georgios Hadjikyriakou. Cynara makrisii is a species of wild artichoke endemic to Cyprus (Family Asteraceae). 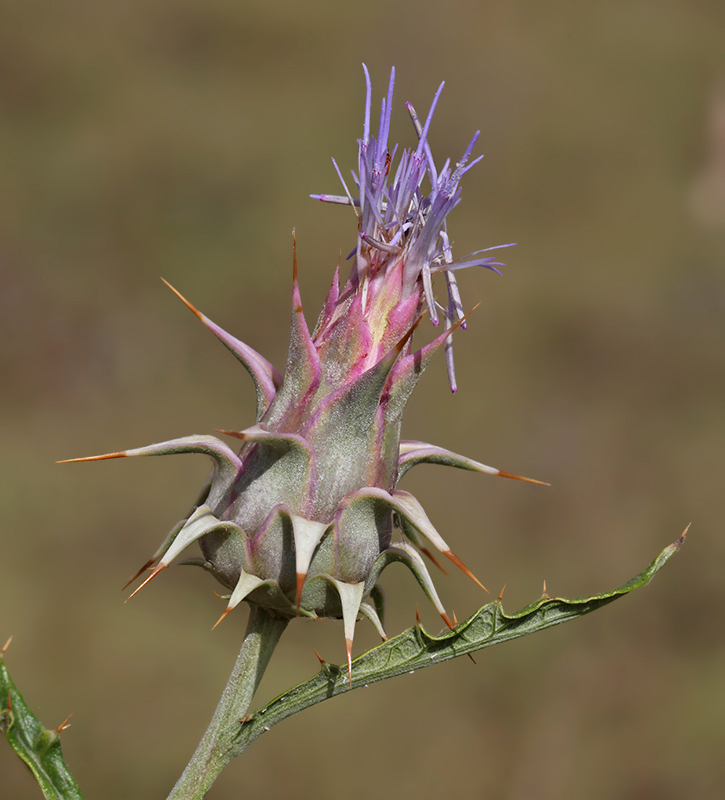 Morphologically it is similar to Cynara cyrenaica , known to occur in Libya and Crete. There is only one known population of this vary rare plant with les than 300 individuals. The plants grow among Sarcopoterium spinosum in frygana vegetation on clay ground at the both sites of the Xeros River (Roudias valley). In my WS I have another photo of the flower. I have also a photo of a plant in its habitat. Congrats! That's great to have a rare flower bearing your name...happy to be your neighbor too. Beautiful flower species and capture. Liked the colors and lighting. The habitat and other closeup images too are good. tfs. Chris, you are a celebrity! What an honour to lend your name to a flora species you discovered 16 years ago! It is an interesting looking species. You have composed your shot extremely well. Thanks for sharing this star status plant associated with you. beautiful close up and really an achievement to have a species named after you. Congratulation! That's great to have a rare flower bearing your name. Superb picture with great pro work. My best wishes and regards. Nice photo of this interesting flower. Amazing colours. Perfect point of view and composition. it is an example of excellent focus on subject with a nice colour combination.Natural colour with perfect sharpness.Well captured. I understand that it's a great honour to have a plant which is named after you. Congratulations! And what a beauty! The photo is fantastic too, just like the WS photos. excellent capture,excellenr rare species,thanks and regards.. Brilliant capture of a very interesting and nice species of plant. Excellent colors, good details and sharpness. I like very much the pink-grey colors of this nice specie. A splendid contrast against the background. A perfect image of this beautifully coloured flower. Subtle tints captured very well. Excellent art picture of a beautiful wild flower. BG is simply superb by blurriness and colouration of the pictured plant. The details of the last one are ultimate and framing/composition are the best too. Warm regards and TFS. The perfect paint MF Christodoulos! Impressive indeed. You're capturing well this plant of rare species by a good composition and excellent tone/clarity, so it's interesting and impressive to see the purple flower with pink/grey petal and sharp orange prickle. Considering a shape or a color, it looks like a peculiar flower to the tropics. And, it harmonizes well with blurred background in the point of entire color balance. Excellent detail,colours and perfectly sharp photo. Excellent macro of the flower, great d�tails and the sharpness is splendid. Wonderful frame too, amazing D/G . Awesome shot, perfect light. Perfect macro and very good detalis.